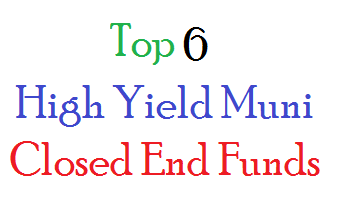 Top 6 high yield muni bond closed end funds are Pioneer Municipal High Income Advantage, Nuveen Municipal High Income Opportunity Fund, etc. High yield municipal bond funds use its assets to purchase lower rated municipal bonds. These bond funds provide tax free high yield income for investors. These funds are suitable for high income investor or retiree who seeks tax free income. These investment funds usually provide the distribution yield regularly (i.e. monthly or quarterly). These high yield municipal bond funds have higher risk than investment grade municipal bond funds. The investment risks include market risk, interest risk, issuer risk, etc. There are 3 ways to invest in high yield muni funds such as through ETF, CEF, and mutual fund. I will focus on high yield muni closed end fund in this article. Investing in high yield muni CEF can provide more opportunities for investors to enhance their returns and/or income. You can buy and sell this high yield muni fund using your brokerage hence this fund is traded like stocks. You can invest as little as $5 per share for regular investment account or retirement account. For your 401k account, please check with your fund administrator about this fund. From this best performing funds list, you may find each individual fund review. You can find the fund performance, expense ratio, and yield or dividend from the table below. The list is sorted based on its year to date performance in 2014 (up to August 2014). Pioneer Municipal High Income Advantage is a 4 stars closed end fund. This best high yield fund invests mainly in US municipal securities. The fund manager is David Eurkus since 2003. The total net assets are $439 million. The annual expense fee is 1.19% per year. The effective leverage is 34.55%. The current yield is 7.57%. This high yield municipal bond fund has returned 14.31% over the past 3 year, and 17.90% over the past 5 year. In 2014, the YTD return is 23.77%. The current market price is $15.02. The average duration is 19.51 years. There are 147 holdings. Top 3 sectors are health (29.5%), transportation (15.70%), and education (10.30%). Top 3 holdings are BlackRock Liquidity MuniFund, North Texas Twy Auth 5.75% 5.75 01 Jan 2033, and Lehman Mun Tr Rcpts Various St Ctfs 01 Jun 2037. Nuveen Municipal High Income Opportunity Fund objective is to achieve high current income exempt from regular federal income tax. Managed by John Miller, this muni bond fund has taxable equivalent yield of 10.77%. The expense fee is 1.28%. Morningstar has ranked this NMZ fund with 4 stars rating. It has 3 year annualized return of 12.25%. This fixed income fund has returned 15.28% over the past 1 year, and 12.58% over the past 5 year. The annual portfolio turnover rate is 8%. Top 3 bond sectors are limited tax obligation, education and civic organ, and health care. The average coupon is 7.55%. The current market price is trading at 2.62% discount to its NAV (Net Asset Value). Pioneer Municipal High Income fund has market value of $340 million. The total leverage ratio is 25.26%. This fund has a share price of $15.08. This top high yield muni bond fund has an average duration of 12.08 years. In 2014, the year to date return is 16.55%. MFS High Yield Municipal fund seeks high current income exempt from Federal income tax with capital appreciation through investment in non-investment grade bonds and notes. The fund sponsor is Massachusetts Financial Services / MFS Investment Management. With $210 million of assets, it has a tax free yield of 6.68%. The expense fee is 2.00%.